Sure has been an interesting, cool summer growing season. We got off to a late start (ground still frozen in mid-March), and things stayed pretty cool and wet through most of April. It was still very cool in early May- the earlier garden plantings either didn’t happen, or didn’t thrive. Our first transplanted summer squash and cucumber plants either died early, or are still producing, during August! The second planting, from seed, barely germinated, and the third planting didn’t do much, either. Not a great year for summer squash. Fortunately, I had some early cucurbits because a few were planted in our new greenhouse. The field tomatoes, planted the first weekend in June, are just now thinking about ripening. Honey Grape plants look so good we’ll consider them for a greenhouse variety next year. Aphid and whitefly pressure are surprisingly high in the planting area, and there have been very few of those 90 degree days where you can almost watch tomatoes grow. Nutrient testing is needed, but lack of heat has been an issue for everyone in our region. Okra has really languished as expected in a cool summer. The greenhouse tomatoes, while not hitting the 30 lb per plant yields possible for the variety, are doing pretty well. The Geronimo plants in our smaller greenhouse have lots of stem borers, but it hasn’t slowed them down much. Both greenhouses are now seeing some spider mite damage which we’re attacking with insecticidal soap. My wholesale buyer has been a disappointment- they have yet to buy a single batch. Market sales have been really strong, though. I think in the past I underestimated people’s desire for round, red, cosmetically perfect tomatoes. Now that we have the greenhouse space, I will grow more of these (but not as many as this year, unless things change with the wholesale situation.) I am not a fan of having to stake determinate tomatoes in the greenhouse (we are growing Florida 91 this year) and probably will not grow this variety indoors again. I may try it outside during a hot summer. Like most coolish, damp summers (2009 comes to mind,) we have done well with beans. Dragon Tongue beans are more popular than ever, and even the usually-underperforming Royal Burgundy has yielded about 75% of what normal beans would pump out. We have had somewhat inconsistent rainfall, but over an inch this week means the beans will probably give us another showing in a week or two. The long beans, in the greenhouse, are also facing spider mite pressure, but are now beginning to crank out marketable quantities of beans and should continue doing so until cold weather hits. Beets have been good this year and I wish we’d planted more early ones. The early spring lettuce didn’t bolt until around July 4th- some years it’s more like June 4th! 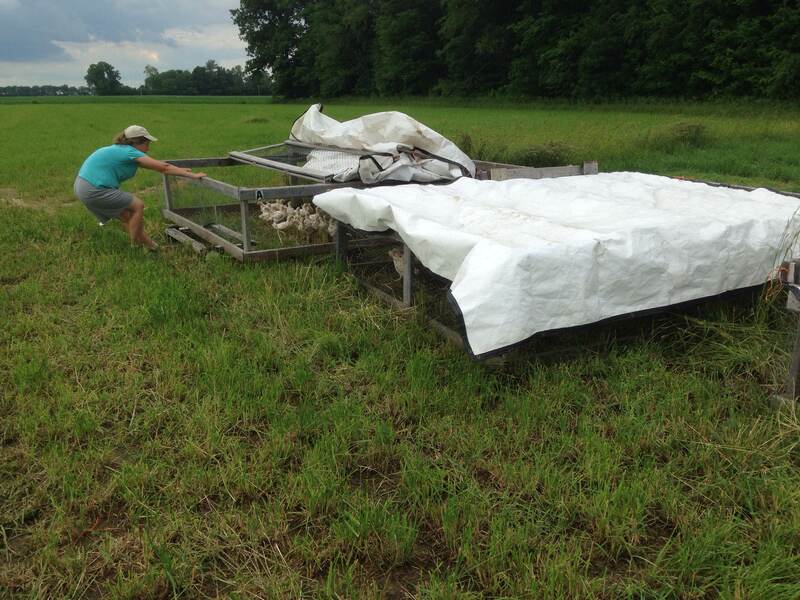 If we’d known it was going to be so cool, continuous lettuce planting would have been a good idea. Kale and chard have been good all season so far and the chard has not been plagued with blister beetles much. Maybe they’re staying in the alfalfa. Winter squash plants took longer than usual to vine and set fruit, but they seem to be doing ok now. Peppers and eggplant both struggled- late germination (it was cold even in the greenhouse) and small transplants. We’re looking at a heated area for this next spring, if finances allow. Transplanting them into the greenhouse is another possibility now that we have more space. The fall crops look outstanding, possibly on track to be the best ever. We have heavy cabbage moth pressure and are struggling to keep the Bt on the plants in the damp weather, but we got the plantings in on or ahead of schedule and they are doing great. First carrots are just reaching edible size and a good sized second planting looks to have germinated well and should also be ready later in the fall. Turnips, fall radishes, beets, and lettuce are also on track. We’ve started a nursery bed in the greenhouse for some winter greenhouse crops including celeriac, kale, bok choy, and lettuces. We’re still waiting to hear about what our winter market situation might be. Both of our winter markets were challenging in the extreme cold and snow of winter 2013-2014. If we don’t have a winter market, there’s going to be a lot of fresh produce in our house this winter! We’ve been busy as always this spring. 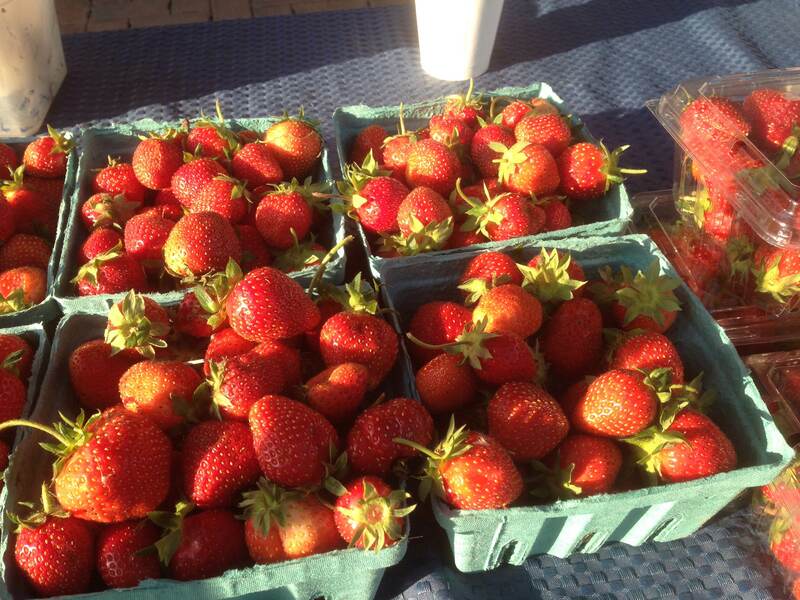 The strawberries, planted in 2012, are having their “money year.” We’ve picked (and eaten) lots! Over 90 quarts last week. The broilers are out on the pasture and on the move. They’ll be processed on July 11th. The new greenhouse is up. The two largest greenhouses are full of tomato plants, many of which are almost as tall as I am. A few tomatoes are starting to change color. We started the staking process for the field tomatoes (which are still tiny) today. I requested a GAP audit (required by our customer) yesterday, so that will also be happening soon to be sure we have the food safety system properly in place. The not as great- the early squash plantings look terrible. Some were planted too early, others were devoured by flea beetles and the striped cucumber beetle. The fate of the winter squash still remains to be seen- it just germinated and is in a different field from the early stuff. After the rain, due to start tonight, we’ll decide whether it’s time to break out one of our OMRI-listed, organically approved sprays for the problem. 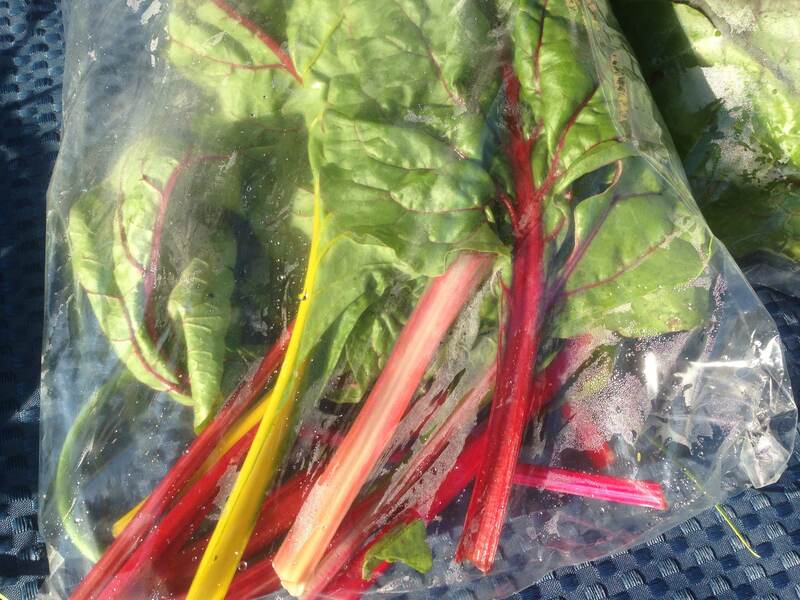 We’re changing our CSA program for 2014. Check out the CSA page for more information. The other big change is we’re taking on wholesale sales. The biggest change our farmer’s market customers will notice will probably be MORE TOMATOES, since our wholesale customer has a very specific size of tomato they prefer. As long as it’s a reasonably good tomato summer, your opportunities to pick up a 25# box of tomatoes for a wholesale price should be quite abundant. This change also means a third greenhouse is in the works. 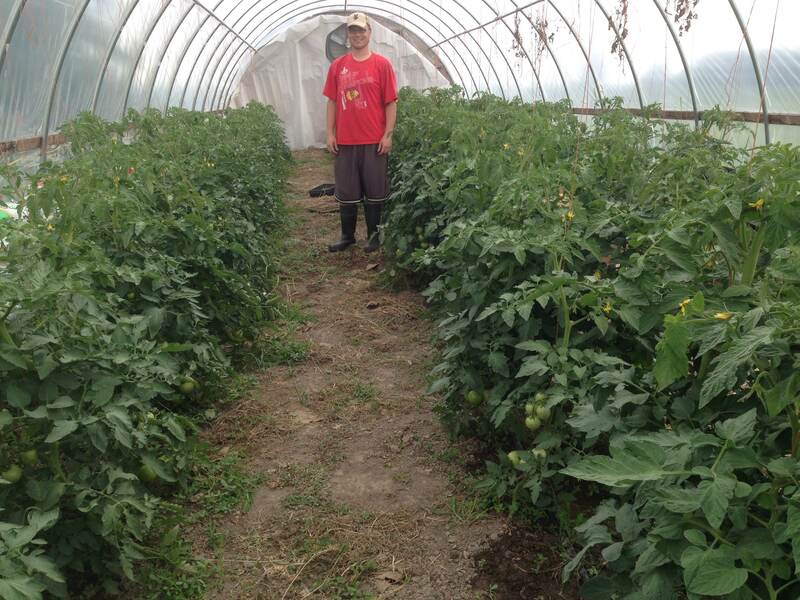 For 2014, it will be planted with the bulk of our wholesale tomato crop. It may house a fall wholesale project after that (I can grow a lot of bok choy in 3000 – 4500 square feet!) or it may house our best winter market product selection ever for winter 2015.. who knows? 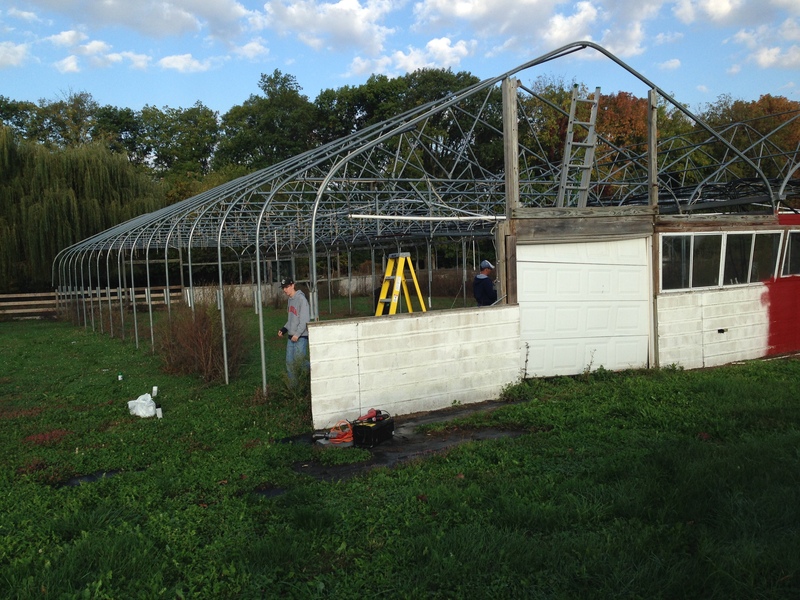 Here is a photo of our “new to us” greenhouse being taken apart. We bought it used, moved it 50 miles, and now it’s sitting in our field, disassembled. When weather permits we’ll stake out the corners and get started on putting it back together. As a farmer, I sometimes share this frustation. We hear from customers that they want the freshest, pasture raised eggs and meats. They say they prefer to consume animals given only organic and/or soy-free feed. Yet we can have trouble selling such products once they’re raised. The perception that healthier food is “too expensive” is a battle we all face. However, this particular farmers market is located in the 35th-wealthiest county in America. The majority of our customers are wealthy by any standard. The problem may not be in the price of the food but in the mind of the customer. When you’re used to cheap food, anything that costs more makes you think you’re getting ripped off. A recent Mother Jones article points out how Americans spend less of their income on food than any other country by a substantial margin. If you truly care about how your food is produced, you have to be willing to spend more, because it costs more to produce better food. We small farmers are, with rare exceptions, not making a fabulous living raising our animals or produce. Some call this “voting with your food dollars.” Even on a tight budget, there are ways to eat better food. Often great savings are available by purchasing in bulk. Buying a whole or half pastured hog or grass-fed beef provides substantial savings over buying individual cuts. We are able to offer special deals to customers who purchase 5 chickens or more, or who buy eggs regularly in quantity. If the struggle is more mental than financial, think of it as spending money on your health, as well as improving the health of the land. If you can eat better food and stay healthy, that’s priceless. Ready to think summer? We’ll be offering the following tomato varieties for sale as plants this spring. It’s a good idea to pre-order. They will be available starting in May. Amish Paste: 85 days, indeterminate. Slow Food Ark of Taste variety, with good reason! Oblong with a pointy tip, these have an acid, complex flavor, are dense without the overly dry and mealy texture of many paste types, and even in a bad tomato year make really tasty tomatoes. About 2 – 2.5 times larger than a typical Roma. Opalka: 82 days, Indeterminate. Another large (3 x 5 inches), dense, tasty red sauce tomato. 2013 will be our first year trying it. Seed catalogs say it does well in heat, is also good for drying, and has unusual, crinkly foliage. Aunt Ruby’s German Green: 88 days. Enormous green slicer, ripe when the color lightens a bit and the blossom end softens. If you wait until the blossom end gets a tiny bit of yellow and pink striping, the fruit will probably have cracked, but what awaits you may be the best tomato ever. Fruit tend to be catfaced and otherwise gnarly in appearance. Your caprese salad will look better than ever with a few of these slices in it! Rutgers: 75 days, Indeterminate. Two different tomatoes are sold under the name “Rutgers.” One is this one, the other is actually the determinate “Rutgers Improved,” which, in my opinion, is NOT an improvement. Both are round, red, 8 – 12 oz tomatoes, but the original Rutgers has a great old-fashioned tomato flavor and has the ability to still taste pretty good even if picked green and allowed to ripen at room temperature. (All tomatoes have a soft, unappealing texture after this mistreatment and it’s why grocery store tomatoes are usually so unappetizing.) Several years ago, I was selling tomato plants at a garden center and an older gentleman told me, “There aint no tomato worth growin ‘cept for Rutgers.” Compared to all the new hybrids the shop was selling, he was right! Cosmonaut Volkov: 65 days, indeterminate. Who needs Early Girl when you’ve got Cosmo? Fruit size and flavor very similar to Rutgers, but in my hoophouse the plants were larger, much earlier, and more continuously productive. Like all the Russian heirlooms, favors cooler weather rather than months of 90+ degree heat. Eva Purple Ball: 78 days, indeterminate. Pink/purple perfect spheres, tasty and productive even in summers like 2012. German heirloom. Copia: 85 days, indeterminate. Large yellow tomatoes with red stripes. A recent cross of Green Zebra and Marvel Stripe, the latest in my quest to find a yellow tomato I like eating. Striped Cavern: Red and yellow striped tomato with big lobes for stuffing, it looks almost like a striped bell pepper. Not a shining star in the hot summer of 2012, but normally should produce big, juicy fruits. Goldie: Indeterminate, 90 days. A 1977 introduction, this is a huge yellow tomato which is supposed to be really delicious once it gets yellow-orange. In our fields they rarely stay unblemished, but maybe those of you with tomato cages and time to pay closer attention to individual plants will have better luck. Black Cherry: 75 days, indeterminate. Dark purplish-black colored cherry tomatoes with all the heirloom deliciousness you’d expect from their color. We grew this tomato in 2011 and not in 2012 due to a germination problem. I got more requests for it than anything else, for good reason! These tomatoes get grafted onto special rootstock which makes them crazily vigorous and disease resistant, then we plant them in our hoophouse. We don’t sell them as plants because the seeds, rootstock, and grafting time add up to make them much more costly than regular tomato plants. This extra “oomph” is rarely needed in a backyard tomato. We also like to grow cherry tomatoes in the hoophouse because they don’t have problems with cracking in the rain like cherry tomatoes so often do when grown outdoors. Rebelski: European style fresh market tomato with slight ruffling at the top. Large, perfect fruit in great abundance. They taste good enough to sit on the table with the heirlooms and ensure that we’ll have some tomatoes in super hot summers! Montesino: Red grape type cherry tomato. Really, really sweet flavor, and when grafted onto a good rootstock they climb to the roof of the greenhouse in no time. Toronjina: Orange cherry tomato. So far, the best orange tomato I have ever eaten. Still looking for the full sized orange or yellow tomato that is their equal!